I started out 2014 thinking “do all the things!”. I set myself up with the task of reading as many books as I could manage – even making them a theme for blog posts. I set aside time for fiction writing, and for reading books written by writers on technical aspects of writing. I wanted to keep reading about how to improve – habits, productivity, etc. I also wanted to keep reading about professional development. I decided I would write or read before or after work, blog at the weekends, and hey, I was logged on anyway so may as well mop up any extra work stuff that I didn’t have time to do during the week, right? One of the benefits of going to CFS management sessions (thank you NHS), is the insight it gives you into what you are actually doing. I like to keep my brain busy, and I figured that as long as I cut out other areas that would make me tired – like exercise and a social life (hey, I’m an introvert) then I’d have no problem doing as much reading and writing as I could squeeze in. What I’ve realised – thanks to what I learnt at the CFS course – is that I kind of knackered myself out. The course told us that we need to find balance between mental, physical, emotional and social activity. It also taught us how to use mindfulness as a tool. I’m not sure I was ready to switch straight from a goal orientated perspective to “oh look, miraculously my energies have completely balanced overnight”. Looking back, I needed to do what I did – which was something different. Well, sort of. It started with discovering The Last of Us. Then I got into YouTube Let’s Plays, and then I watched a YouTube ad for some game called Dragon Age: Inquisition. Goodbye obsessive productivity – hello Thedas! All three games. Music from said games. Novels set around said games. Art books. The comic collection. Books of lore. Even a bloody anime. All of these things have been acquired by me over the last six months and played/listened to/(and started to be) read. The Dragon Age series is a perfect storm – great storytelling, funny dialogue, memorable characters, amazing worldbuilding (you should see the passion with which fans debate the political issues presented in the games) and a great fantasy world. 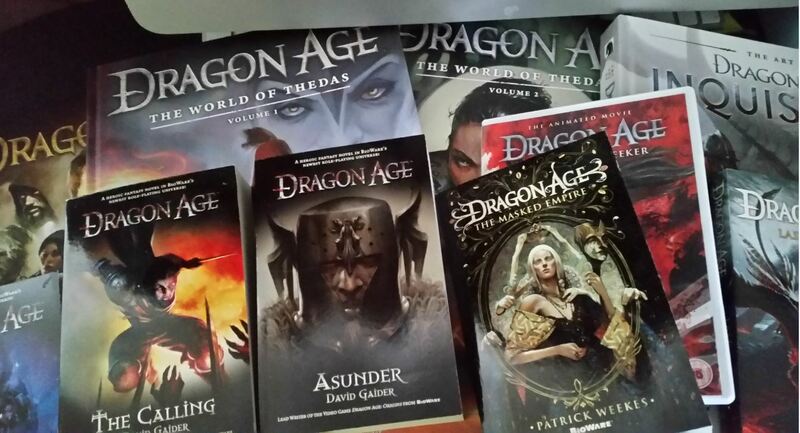 I love fantasy fiction and I can get pretty obsessive about fantasy worldbuilding, so it’s no real surprise that I’ve gone slightly mad over the series – thanks BioWare! But, it’s also introduced me to more brilliant YouTubers – like Jesse Cox – whose ongoing playthrough of DA:I is beyond funny. I’ve just started getting back into reading and writing fiction, and I can attribute this directly to Dragon Age. The only difference is, I’m having fun now. Okay, I know, if you want to eventually write fiction for a living, you need to be disciplined – none of this “waiting for my inspiration” guff, right? Well, no. I think there has to be some of that. You have to procrastinate, to have days, weeks, even months or years where you go off and do something else. Not with the aim of finding inspiration, just the desire to do something, anything, else. If you’re lucky, one day something completely random will make you think “I have to write about this – now!”. Life’s too short for that. Have fun!